Noctua has started teasing us for the upcoming launch of their newest, next generation fan design, with over four years of development on new materials that get rid of some of PBT plastics biggest problems, these use Sterrox which is a liquid crystal polymer in the same vein as Kevlar which allows it to have a ordered molecular structure making it a much more rigid in structure as a compound, which helps the fans keep shape after spinning for long periods of time, this in contrast to PBT made fans which has a more chaotic structure and lower rigidity which forces the material to deform due to centrifugal forces. 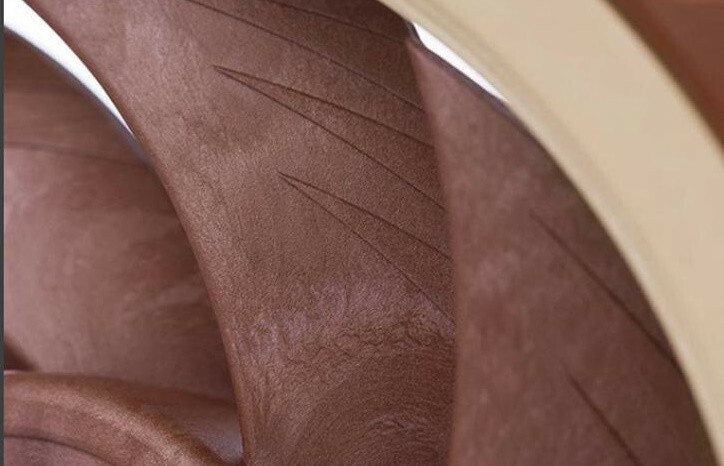 This in turn elongates the blades causing impeller creep which forces designs to take this into account and increases the gap between the frame and fan blades. 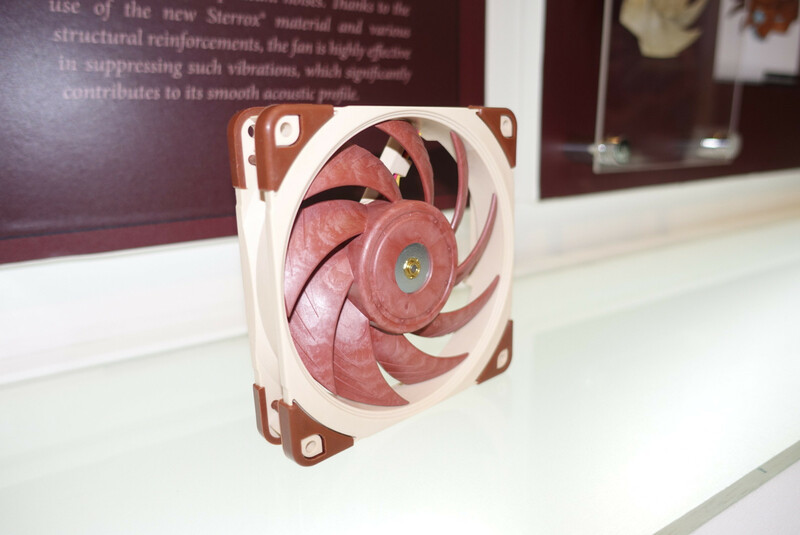 Using this material noctua aimed for a 0.5mm clearance from tip to frame compared to 1.5-2.0mm clearance on most fans which allows better noise and airflow performance. Any Engineers reading already know why this is good, but for the rest of us let me explain. A narrower gap allows less air to leak through it to the back to the front of the fan and keeps more static pressure for pushing through heatsinks and radiators. The more rigid materials should also vibrate less and remain quieter. The new fan line was first announced last year at Computex 2017, and at that time, the development resources poured into the project were well over more than four years and 200 test designs. Though like Thomas Edison when improving the lightbulb, they did not fail just found 200 ways not to make a better fan design. “Max airflow ratings and max pressure ratings don’t mean much at all. 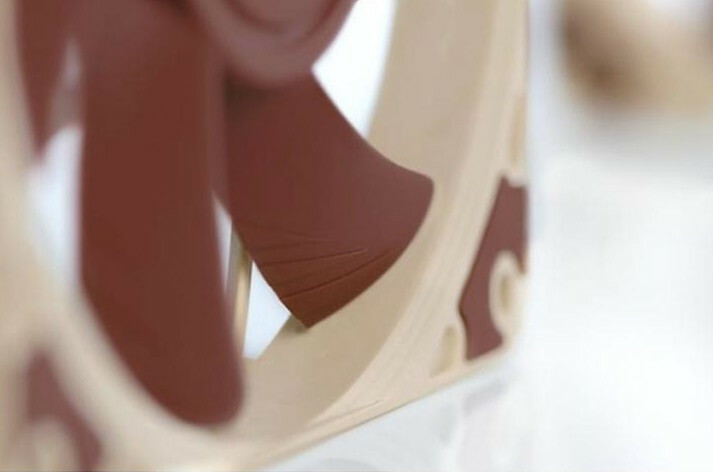 Maximum airflow is measured at zero pressure, so that means the fan is not even operating in free air; there is zero pressure difference between the two sides. So it’s basically operating in vacuum. Not a realistic application. Maximum pressure is at zero airflow. that’s the fan blowing against a closed wall. Not a realistic application either. “What you really want to know is how much air the fan can push against realistic resistance, and this is what you see in the mid part of the curve. 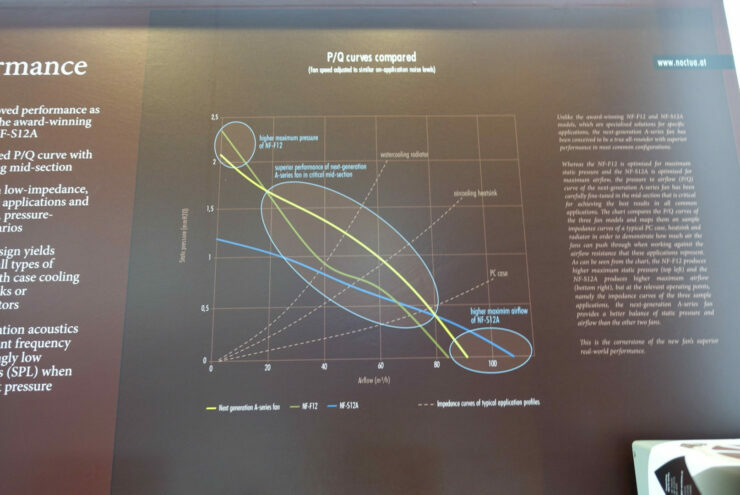 And when looking at the resistance curves and impedance curves of a typical PC case, fairly low resistance, but still way more than vacuum. Where it really shines is on air cooling heatsinks where it can push way more air than the NF-F12, and on watercooling radiators where it can push way more air than the current generation. With all that said the material is still 4 times more expensive than PBT plastic so don’t expect these to come cheap, and we have no word on pricing at this moment, we will be reaching out to Noctua and are waiting on a response.